Love the taste of smoke? Whether it's a hint of smokiness or an intense blast of soot you're looking for, there's a smoked tea out there that's perfect for you. This black tea hails from Mount Wuyi, Fujian, China. Legend has it that it was created when a tea producer's factory was commandeered by troops in the middle of processing and he had to use fire to dry the tea before it went bad. 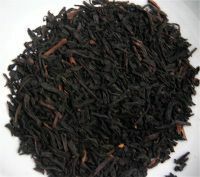 Locally, Lapsang Souchong is known as lìshān xiǎo zhǒng or zhèngshān xiǎozhǒng. These names refer to specific sub-variety of tea plant used to make the tea. However, what's so special about Lapsang Souchong is not so much its sub-variety as its processing. True Lapsang Souchong is dried and smoked over smoldering pine boughs in a multi-floor factory, which allows varying amounts of smoke to reach the leaves depending on where they're positioned in relation to the fire. The leaves are placed in bamboo baskets or over woven bamboo mats to allow the smoke to waft in. The smell in a Lapsang Souchong factory is about as intense as you'd guess! The strongest Lapsang Souchong teas are sold as "Tarry Souchong" ("tarry" literally means "pine tar"). Some teas sold as Lapsang Souchong are artificially flavored with smoke flavor (which is, in some cases, the same kind used in barbecue flavoring--yikes!). Although Lapsang Souchong is not popular in China, it is popular in Europe and, to a lesser extent, America. Many people who love whiskey love Lapsang Souchong. It was favored by Winston Churchill. Although it's often categorized as a black tea, true Russian Caravan tea is a blend of Lapsang Souchong tea, Keemun tea (which can have a slightly smoky flavor on its own) and oolong tea. Sometimes Yunnan red teas are also used. Russian Caravan smoked tea tends to be sweeter and maltier than Lapsang Souchong, with less of a pine note. Legend has it that Russian Caravan teas originated during the long overland journey from Chinese tea producing regions to Europe via Russia. Campfires made from dried camel dung were said to have influenced the flavor of the tea, giving it a distinct smoky note. Needless to say, that's not how Russian Caravan teas get their flavor today, but the love of smoky "Russian Caravan" teas remains strong.